The results show that there is more REM sleep in the beginning of sleep in sleep episodes of free-running rhythms as compared to sleep episodes of entrained 24 hr rhythms. This higher amount of REM sleep is due to a longer first REM episode and shorter first NREM episodes. more REM sleep in the beginning of sleep episodes in which the temperature minimum occurs earlier as compared to episodes in which the temperature minimum occurs later. The peak in REM sleep propensity (RSP) occurred on the rising slope of the average body temperature curve, coincident with the phase of peak sleep tendency. 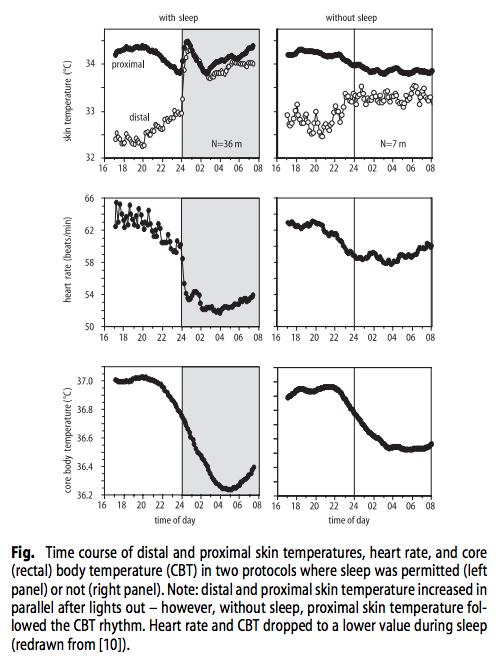 How is the circadian rhythm of core body temperature regulated?